The megalithic tradition of the Hynniew Trep people of Meghalaya in NE India. 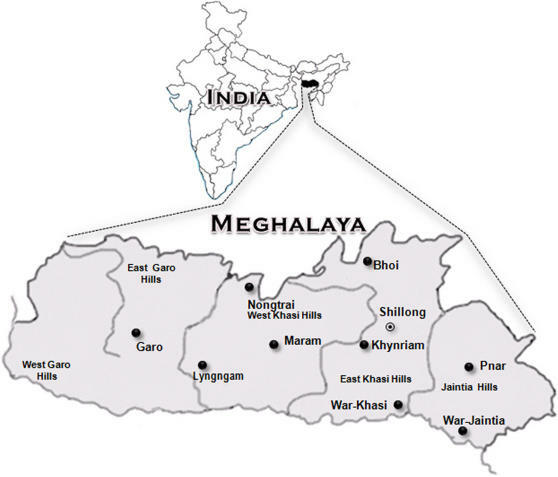 The state of Meghalaya was separated from the state of Assam in 1972 as a tribal state under the 6th schedule of the Indian constitution for the Hynniew Trep people in the eastern and the Garo people in the western part of the state. This eastern part of Meghalaya which consists of the Autonomous Districts of the Khasi Hills and the Jaintia Hills is one of the few places in the world where a megalithic tradition based on the Hynniew Trep religion Niam Tre, remains alive. The Hynniew Trep people, consisting of the sub-tribes Pnar (or Jaintia), Khynriam, War and Bhoi and, according to some anthropologists, the Lyngnam people of West Khasi hills, use a variety of megalithic monuments in the mortuary rituals of their traditional religion. Among the monuments used are mawbynna, standing stones, often in groups of three or more and usually associated with large horizontal table-stones called mawkynthei, mawshieng, small ossuaries for temporary storage of the cremated bones of individuals, and mawbah, large ossuaries for the permanent interment of the cremated bones of an entire clan.